Impact on the far side of Mercury, out of contact with Earth, is believed to have occurred at 3:26 p.m. EDT (GMT-4). Scientists and engineers confirmed the mission was over at 3:40 p.m. when they attempted to contact the spacecraft. There was no response. 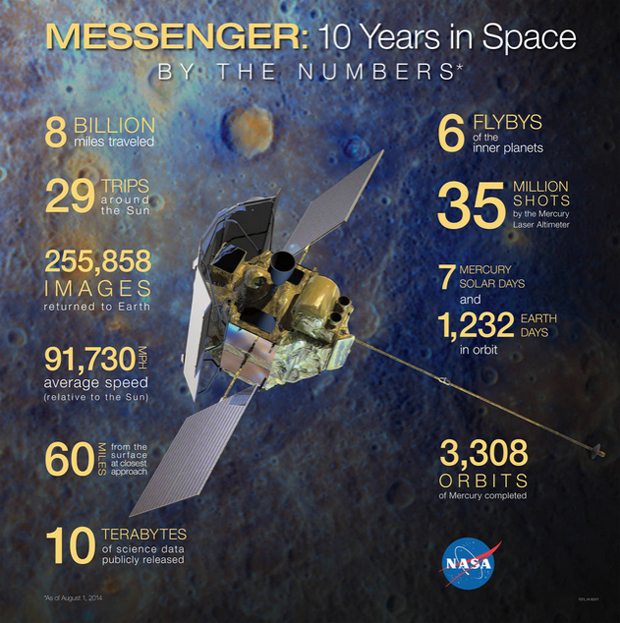 "Today we bid a fond farewell to one of the most resilient and accomplished spacecraft ever to have explored our neighboring planets," Sean Solomon, Messenger’s principal investigator, said in a statement. "Our craft set a record for planetary flybys, spent more than four years in orbit about the planet closest to the sun, and survived both punishing heat and extreme doses of radiation." Solomon praised Messenger's "resourceful and committed team of engineers, mission operators, scientists and managers" for a mission that "surpassed all expectations and delivered a stunningly long list of discoveries that have changed our views not only of one of Earth’s sibling planets but of the entire inner solar system."